This photo was taken prior to the ground occupation of south Kharkov by Germans in September 1941. There is a large hill near a railway siding just outside the village of Bezludovka, which is about 15 kilometers south of Kharkov. According to testimony in the possession of Polish authorities, an Ukrainian woman claimed that in the spring of 1940 some Polish officers were unloaded from trains here and taken to the hills for execution. According to Stefan Śnieżko, the woman's descrip­tion of this hill was coincidentally close to the features of Katyń. The photo shows the forested hill, in the middle of which is a clearing with no forestry purpose. One can discern many pits in this clearing. A road leads to this area and an NKVD structure is near the station. Despite this compelling evidence, no official examination of this terrain has taken place. Śnieżko never replied to the evidence forwarded him by Maliszewski. 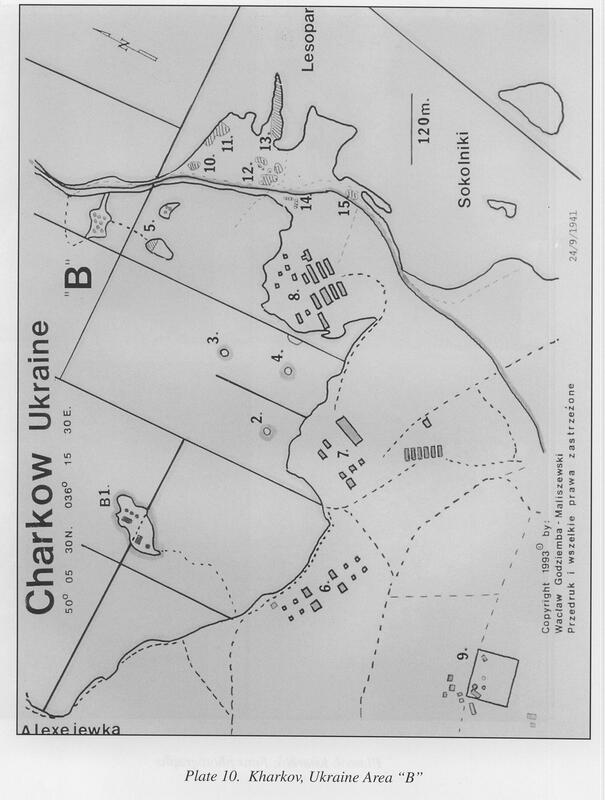 The official Polish position is that all of the Starobielsk prisoners have been found near Piatachatka. Maliszewski believes that the scientific literature does not support this conclusion. Map produced with modern US satellite data, showing locations of areas of disturbed terrain evident in WWII vintage Luftwaffe aerial imagery. 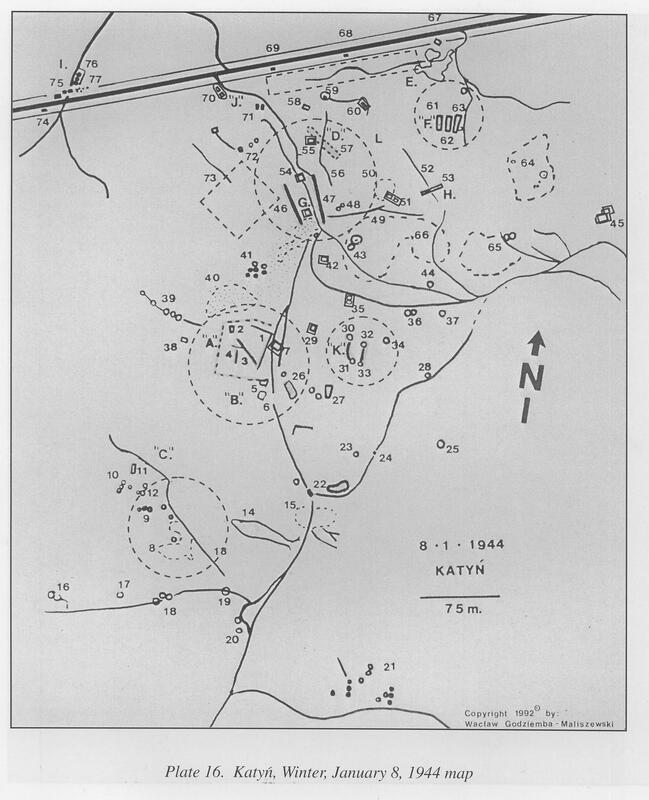 The Polish mass graves are at area "G." Maliszewski believes that additional Polish graves may be at area "E."
A sketch by Maliszewski: In the dense cluster of red shapes near the village of Jamok, were found mass graves containing officers from Ostaszkov. Digging at the other sites of disturbed terrain, also shown in red, was forbidden by the Russian authorities. Plate 4. Miednoje, Area "E"
The "dogbone" shapes of 1,4-10, and 18-19, conform to the shape a bulldozer makes on entering and leaving a long trench. Tokarev testified that such trenches were dug in the spring of 1940 by Soviet bulldozers. This site was off-limits to Polish, investigators. Nikolai T3arvikw o£ the Odessa "Memorial" wrote to M.alisz,ewski (Who had given him this map) and. said, that the local authorities in Tver seized the map when it was shown to them, cordoned-off the area and forbade Tver: Memorial members from inspecting the site. Śnieżko, aware of the site, has made no public comment. 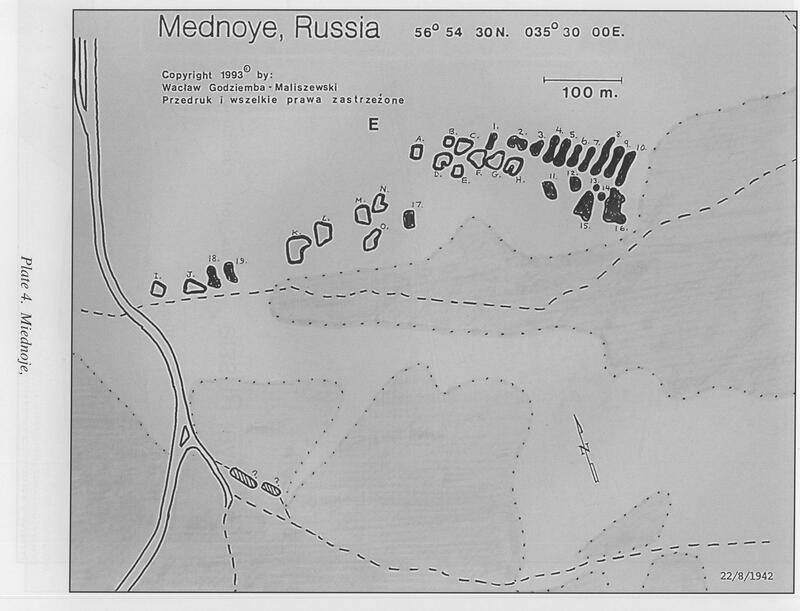 Maliszewski believes that two sites, one at Jamok (area "G") and the other at Miednoje (Area "E") were created to conceal the murdered Ostaszkov Poles. 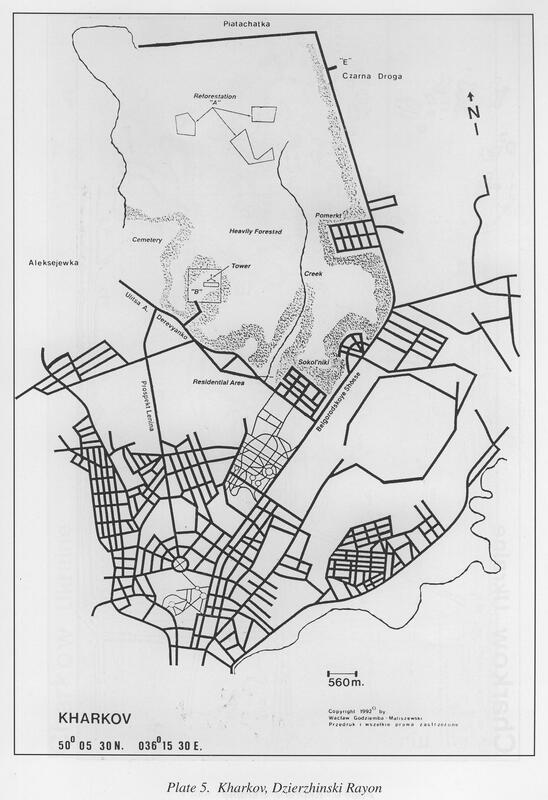 The map was generated for Maliszewski by the U.S. Government at the request of Professor Zbigniew Brzeziński. 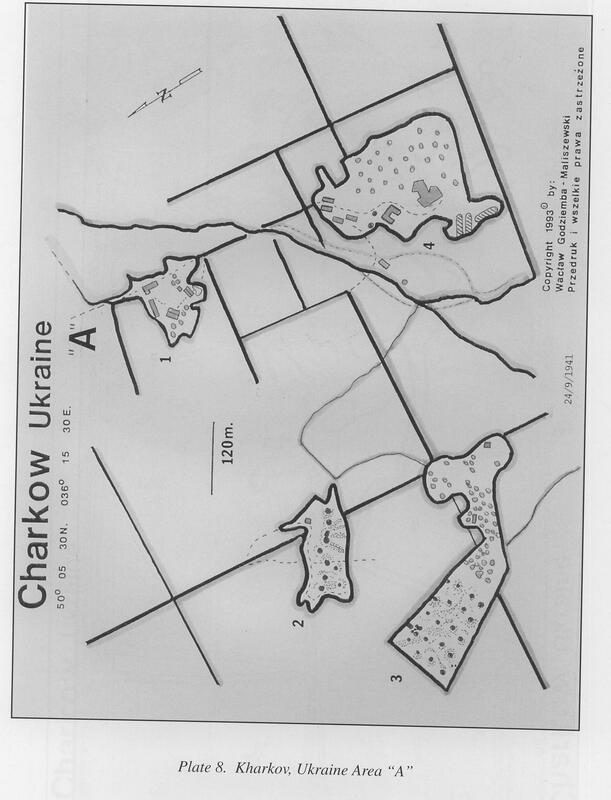 It shows areas of interest to Maliszewski including A, B, and E. The Czarna Droga [Black Road] area near the village of Piatachatka contains mass graves associated with the Starobielsk officers. 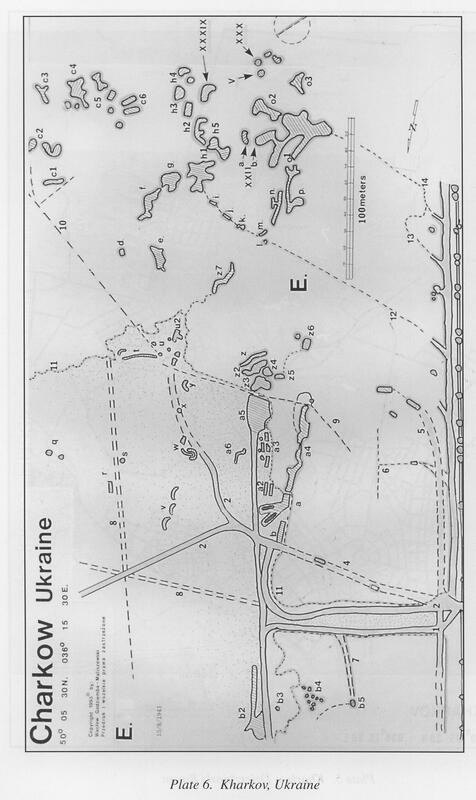 Maliszewski believes that additional mass graves may exist south of Kharkov at Bezludovka and also possibly at area "B" in this map. 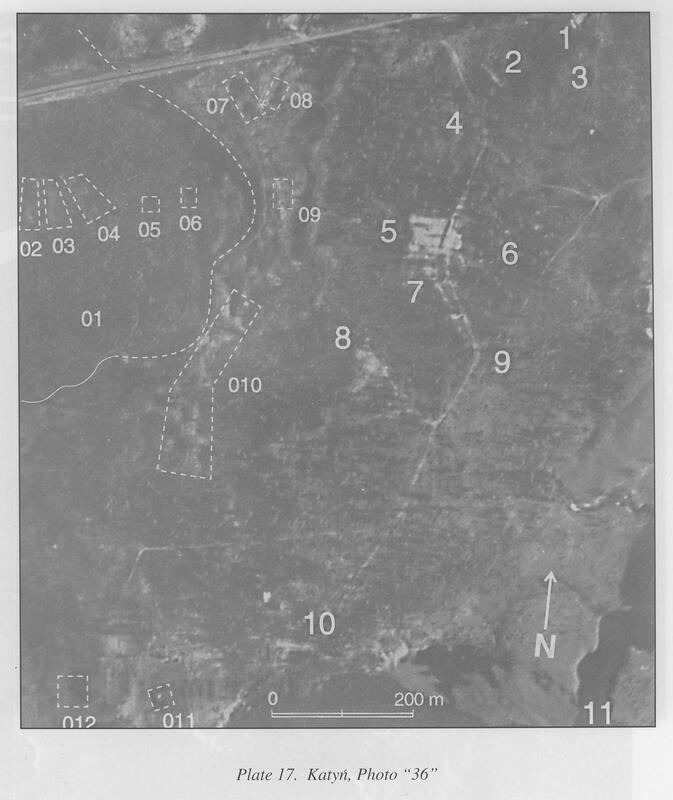 Maliszewski believes that the original mass graves near Piatachataka were at signals "a" through "a-5," and that such were so heavily disturbed at the 1942 Battle of Kharkov that reburial was performed later, evident in the imagery of August 15,1943 at various locations around the sites marked with Roman numerals. 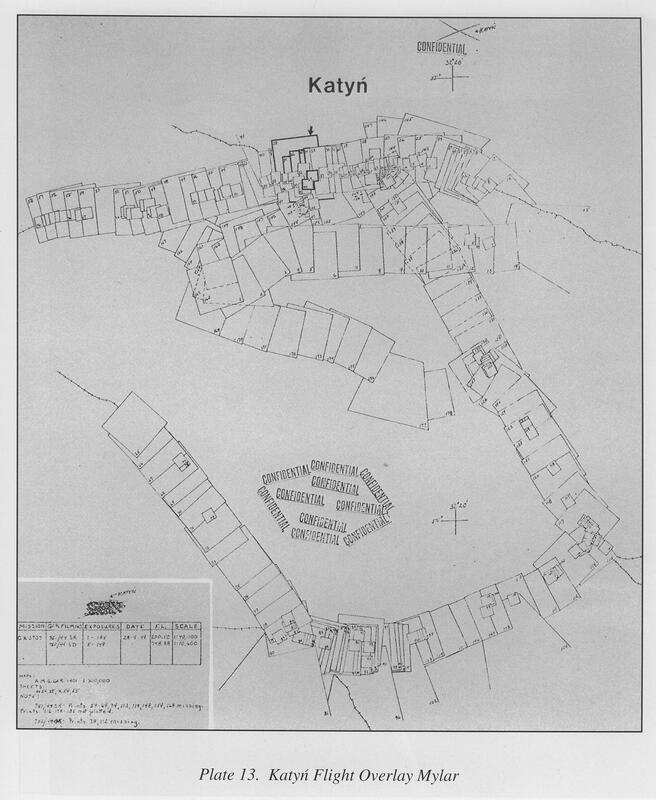 Three areas with Roman numerals were found to have murdered Starobielsk prisoners. 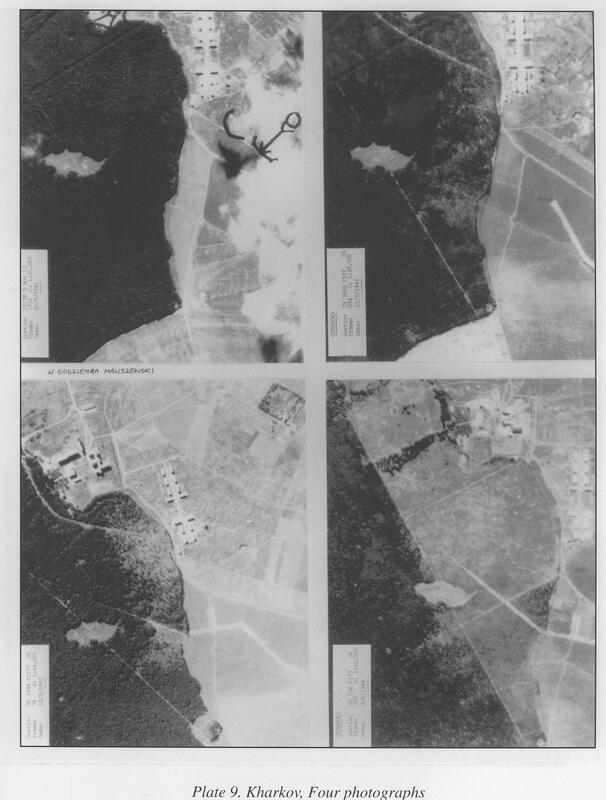 This map shows a superimposition of anomalies and features evident in imagery of August 15,1943 and June 8,1944. 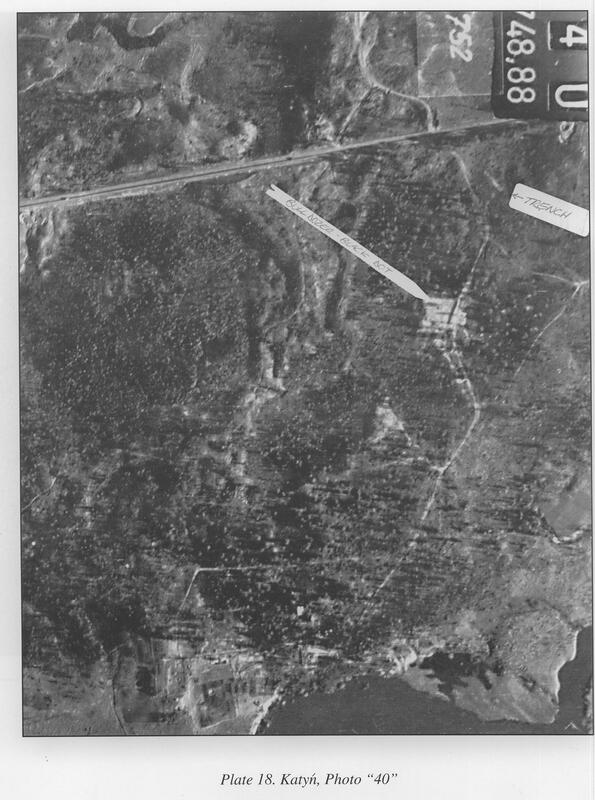 The heavy black lines show clearance of the forest due to bombing. Plate 8. Kharkov, Ukraine Area "A"
Areas 1 and 2 are NKVD dachas. Before and during WWII the forest was fenced-off and entry was forbidden. Areas 2 and 3 show, in red, the signatures of smaller pit graves that could have contained between 30 to 50 people. It is likely that these were created during the 1930s Yezhovschina period of terror. The area is now reforested and no entry was permitted to Polish investigators. 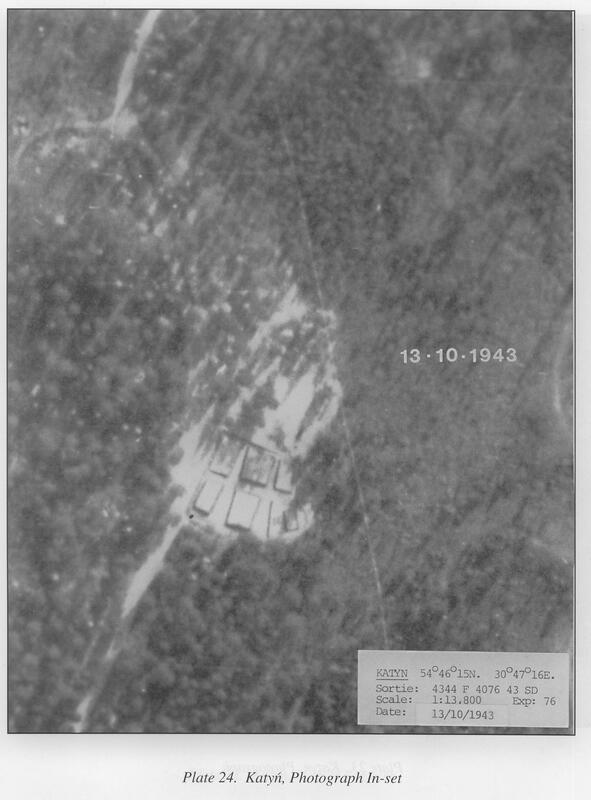 These photographs show changes in area "B" from 1941 through 1944 Area "B" contains signatures of mass graves. It is now the site of a tower. Plate 10. Kharkov, Ukraine Area "B"
The structure at signals 6, 7, and 8 are those of military and police. Signal 9 shows a compound. B-l is the kidney shape, containing signatures of mass graves that were never investigated. Signals 10-13 show probable mass grave sites. Plate 11. 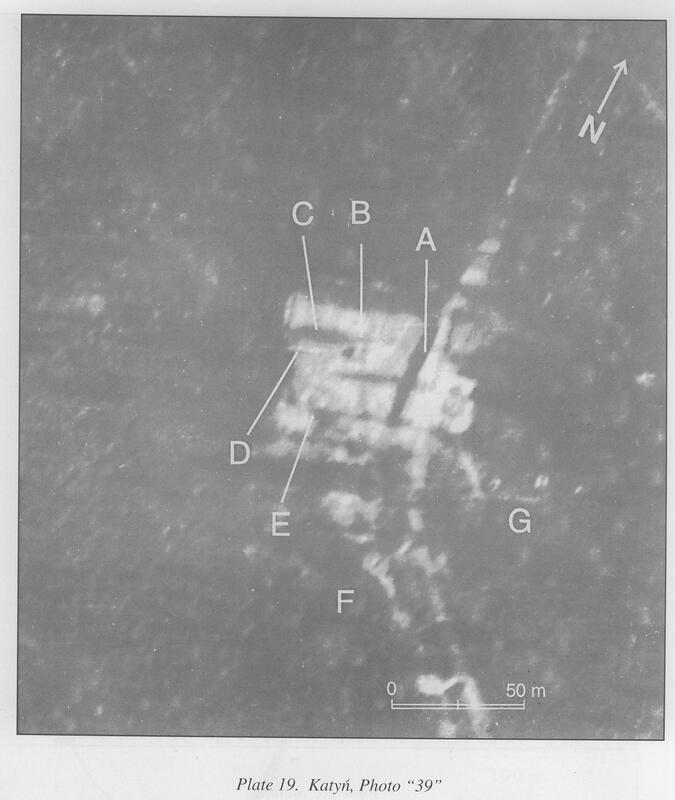 Kharkov, Ukraine Inset study "B"
Three trench-like anomalies are shown as well as nine pits. 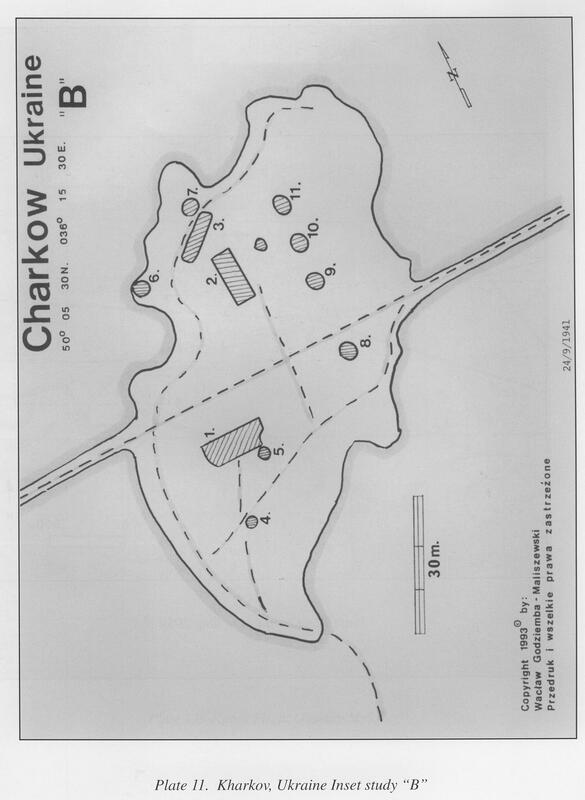 Maliszewski speculates that high ranking Polish officers may be buried here in contradistinction to the Piatachatka site where few high ranking officers were found. The area was offlimits to Polish investigators and now contains a tower. 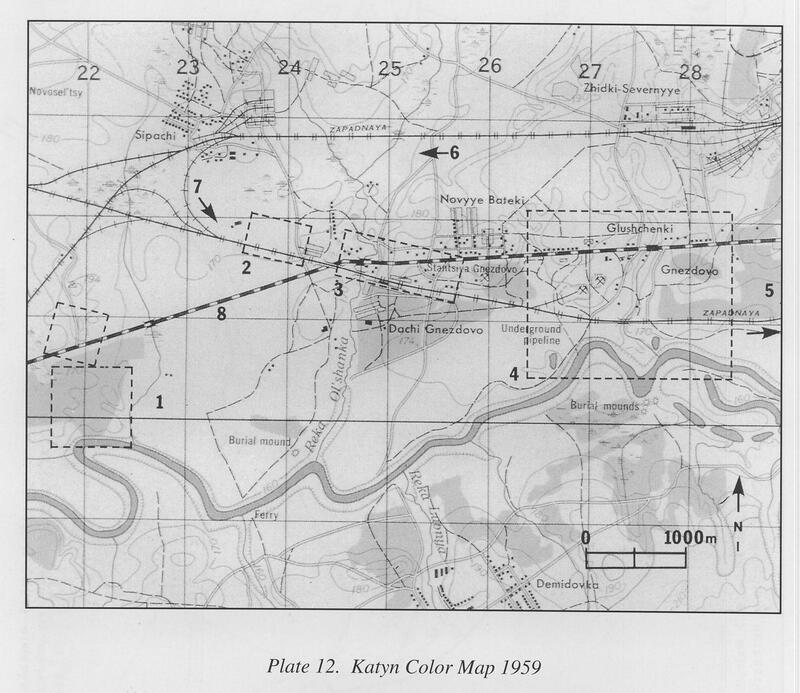 U.S. Army Map Service 1959 map showing the Katyń forest and Gniezdovo station. The original map omits details of forest roads. Maliszewski has superimposed various signals. 1. Katyń forest mass gravesite. 2. The "Lesopolosa" site where Maliszewski discovered the true detrainment site and also a structure that may be associated with executions. 3. Gniezdovo station. Showing the position of the numerous Luftwaffe images. "Confidential" has been stamped eleven times by American censors, circa 1950. This is the site of the "Lesopolosa" that the Russian witness Krivozertsov indicated in his Ancona testimony in 1946 was the position north-west of the Gniezdovo station where the Poles were taken off the trains. Krivozertsov's testimony was later manipulated to come into agreement with Professor Swianiewicz's statement that the detrainment site was at the station. This is a considerable distance from the station. "A" indicates a structure that Maliszewski believes may be associated with the murders. "B" is the rail spur. Soviet interest in this area was equal to Katyń forest in that this photo and the photo of the bulldozer in the forest are of the same date, April 28,1944. Many vehicles and personnel of the NKVD are in the vicinity of the "Lesopolosa." 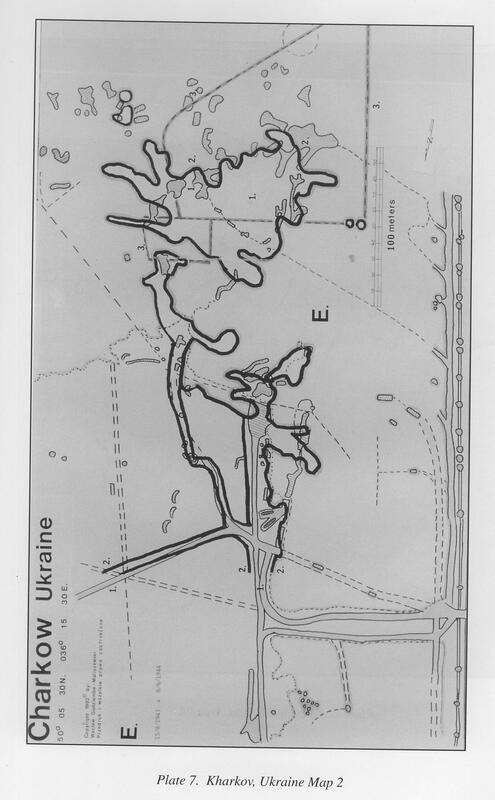 This map was created by Maliszewski showing his observations of Soviet activity, "footprints in the snow." This was in preparation for the later Burdenko Commission presence on the terrain. Not only was the NKVD interested in the Polish graves, but, as indicated by their test holes, in the mass graves of others buried in the environs in the 1930s. Plate 17. 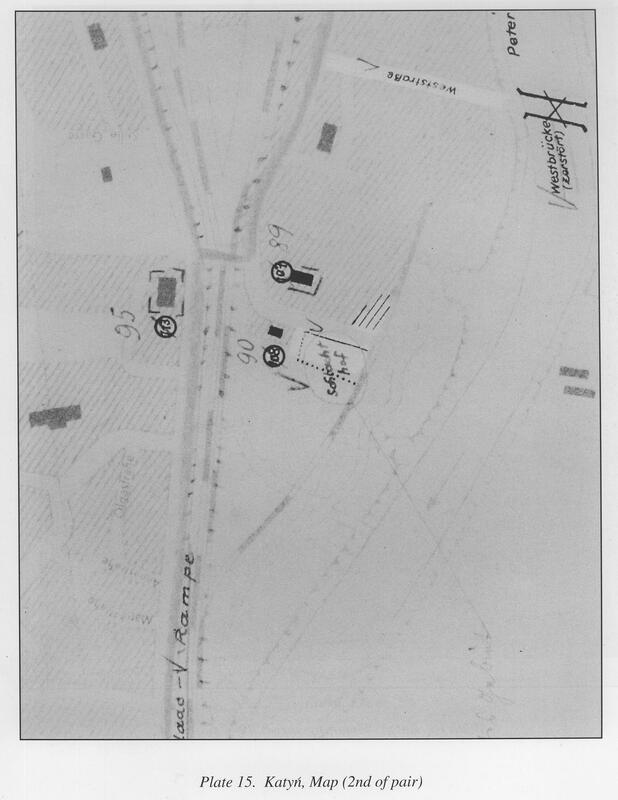 Katyń, Photo "36"
Area "5" shows the NKVD bulldozer wrecking the PKC cemetery and emptying the layers of corpses. Areas 02-06 indicate mass graves created in the 1930s. (It is possible that these contain children of the victims of the purges, murdered after they became a problem for Stalin). Areas 07-010 are also NKVD burial grounds. Area 6 contains graves of Soviet citizens discovered by Germans in 1943. Plate 18. 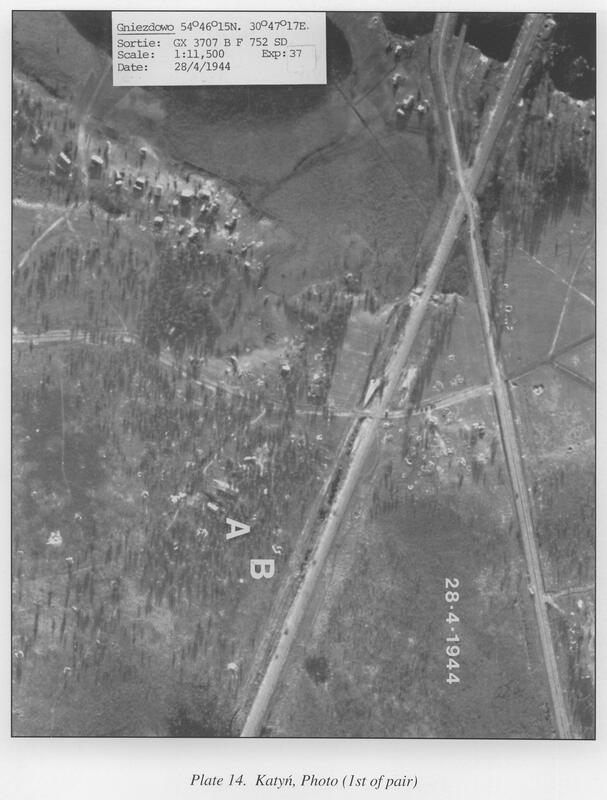 Katyń, Photo "40"
Showing the Katyń graves being bulldozed, and northerly, the first indication of the presence of a trench discovered by CIA analyst, Robert Poirier. Plate 19. Katyń, Photo "39"
"C" is the smoke rising from the operating bulldozer. The deep shadow line at "A" indicates a deep excavation. Drawing from a German repair manual. 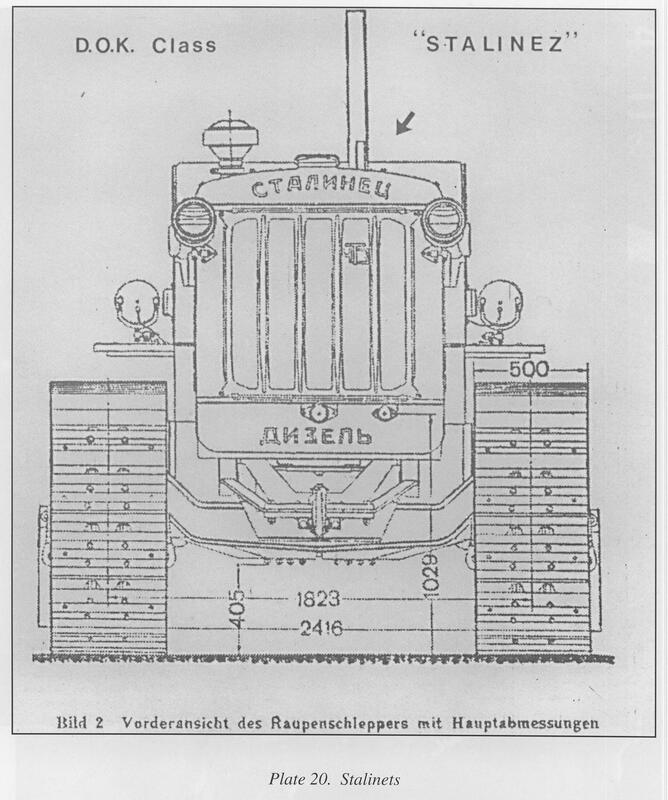 When the Germans captured Soviet equipment they quickly produced a manual of the machine. They could not remove the embossed "Stalinets" markings. Stalin had them placed in exactly the same position as on the original Caterpillar machines he had pirated. 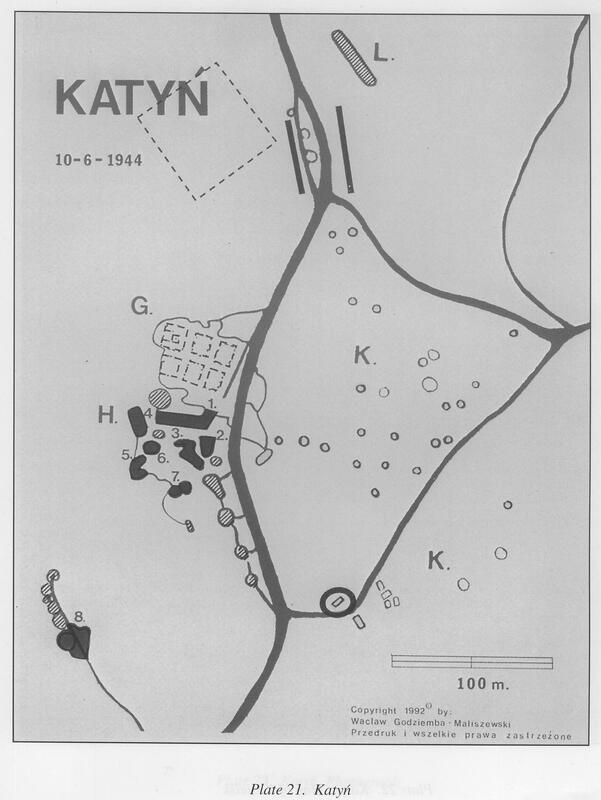 This map, drawn by Maliszewski from his observation of Luftwaffe original photographs, was the model used by the scientists working for the Rada Ochrony Pamięci to locate the graves. Subsequent maps (and academic papers) produced officially by the Poles did not credit Maliszewski's pinpoint accuracy. Area "H" shows the original 1940 mass graves. 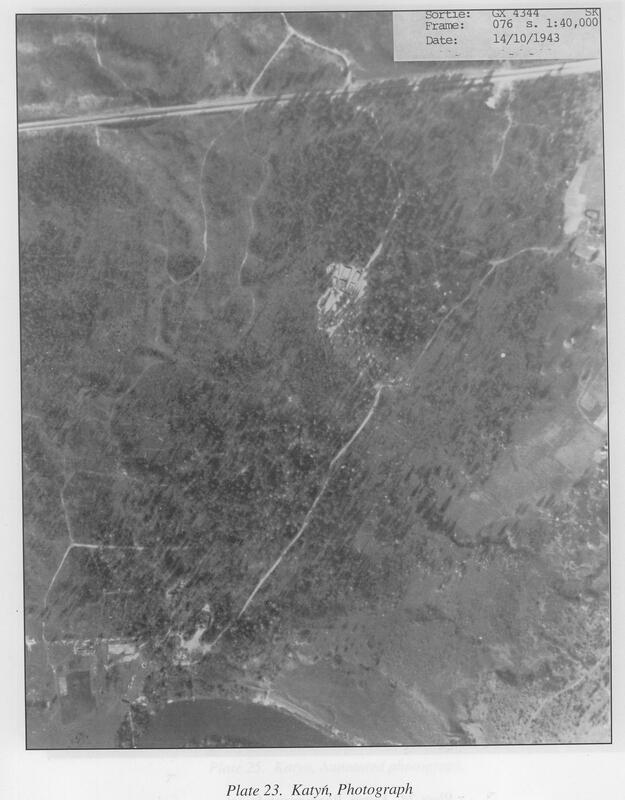 Area "G" shows the 1943 PKC cemetery. The dotted square shows the general location of the cemetery Stanisław Bujnowski noted at Katyń in 1957, the probable location of the 900 corpses reinterred by the Burdenko Commission in 1944. "L" is the trench discovered by Robert Poirier, CIA analyst. 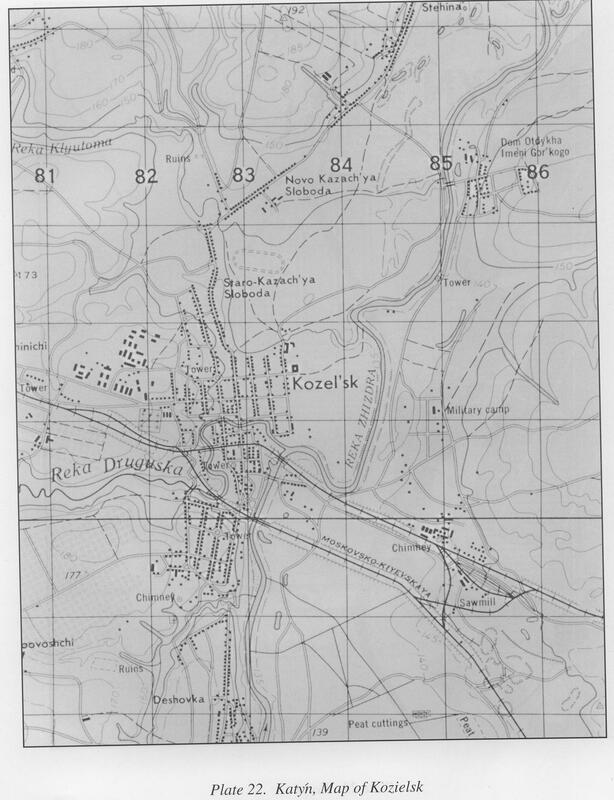 U.S. Army Map Service in-set showing the location of the Kozielsk camp where the Polish officers, later found murdered at Katyń, were held as prisoners by the Soviets. 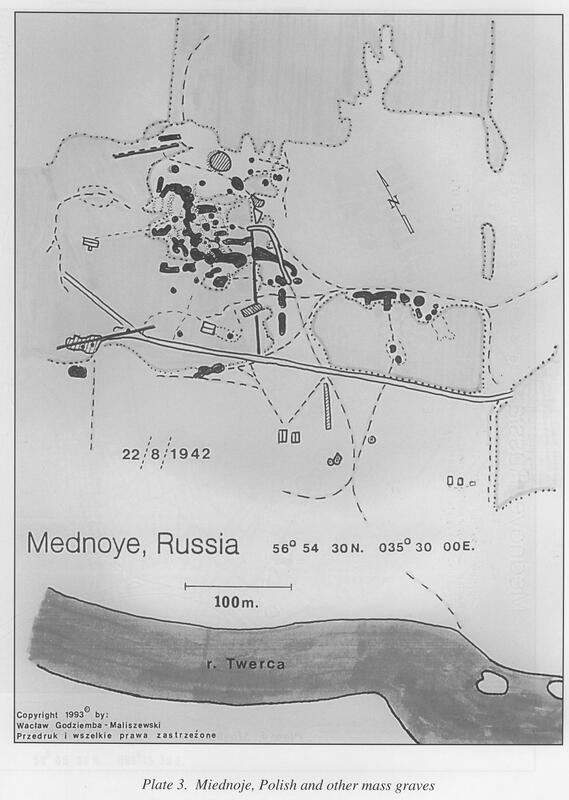 On this map the camp is labeled as Dom Otdykha Imeni Gorkogo [The Gorky Rest Home]. It was a monastery before the Revolution. 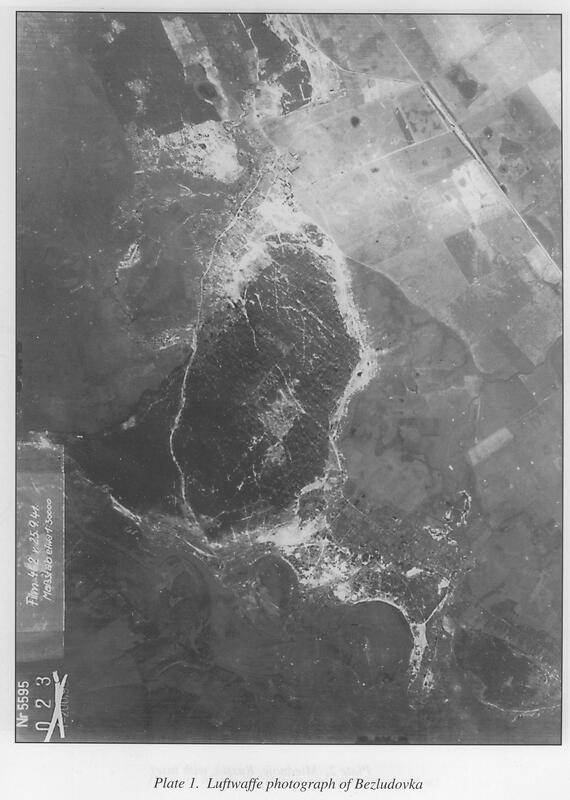 Taken by the Luftwaffe on October 14,1943, it shows the location, below, of the Dniepr River and the NKVD dacha. In the center is the PKC cemetery erected by the Polish Red Cross in 1943. A close-up view of the PKC cemetery. The two smaller squares on top of the large lower right square are the graves of generals Smorawiński and Bohaterewicz. Area "K" shows the camera field of the Soviet propaganda photograph of Gen­eral Berling's "Red" Polish soldiers parading in January 1944. 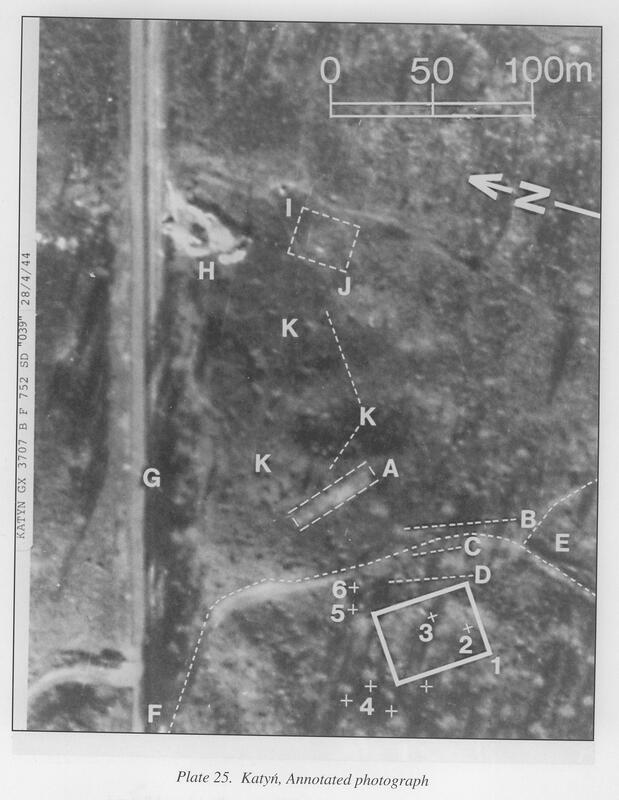 Area "A" is the trench discovered by CIA analyst Robert Poirier that has never been investigated. Area "G" is the Smolensk highway near which the Burdenko Commission removed Polish corpses in its 1944 investigation. The square surrounding area 3 and 2 is the site where Stanislaw Bujnowski noted a memorial in 1957 It is significantly closer to the road than the present Katyń memorial. Maliszewski believes that the 900-plus corpses exhumed by the Bur denko Commission may be buried here. 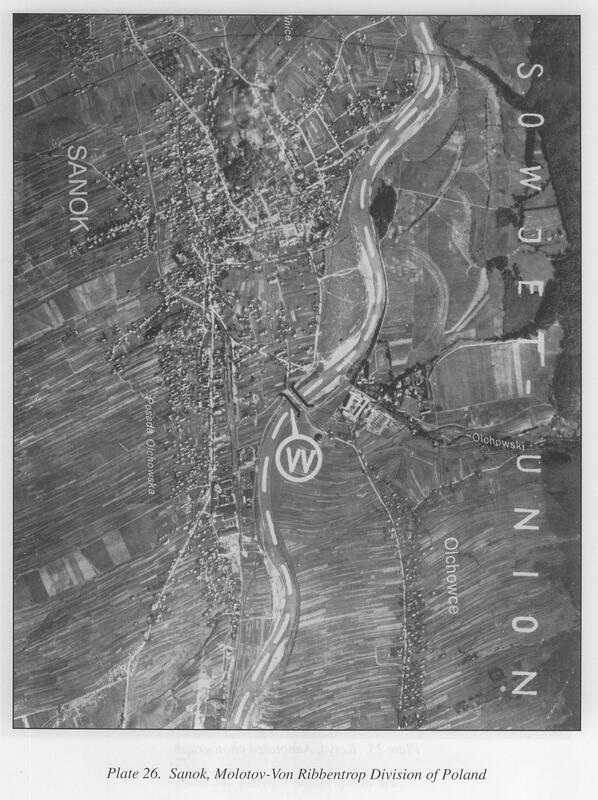 This is one of a series of German annotated aerial images showing the line of demarcation in the partitioning of Poland in 1939. Area "W" is an original German annotation showing a bridge across the San River. 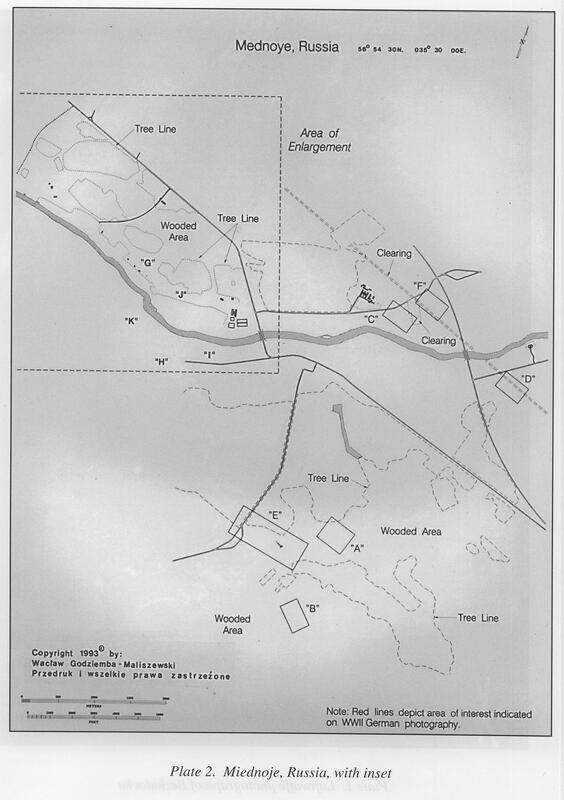 Maliszewski, with microenlargements of this area, identified a prisoner exchange point near the bridge.